This acid free natural white paper is popular among manga artists. Its ultra-smooth surface makes it excellent for use with Copic markers, pen and ink, Crowquill pens, technical pens, waterbased markers, and permanent markers. Erasing is easy, and there's no bleedthrough. 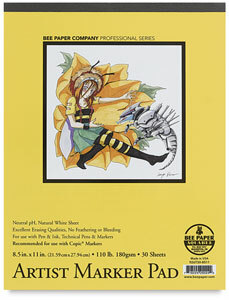 Available in tape bound pads of 30 sheets or packages of 50 sheets. Sheets are 110 lb (180 gsm).